January started with some severe frosts and snow. Long periods where the night time temperature dropped below 0C. After the snow the temperatures soared to heights that are average for May, and when the wind calmed down and the sun came out it did feel like a spring day. Temperatures then fell back to those more typical for winter but still above freezing. Finally there is some sun returning to the garden. At the start of the month the garden is in shade all day, but at the end the back and right borders are now getting a certain amount of sunshine when it is available. 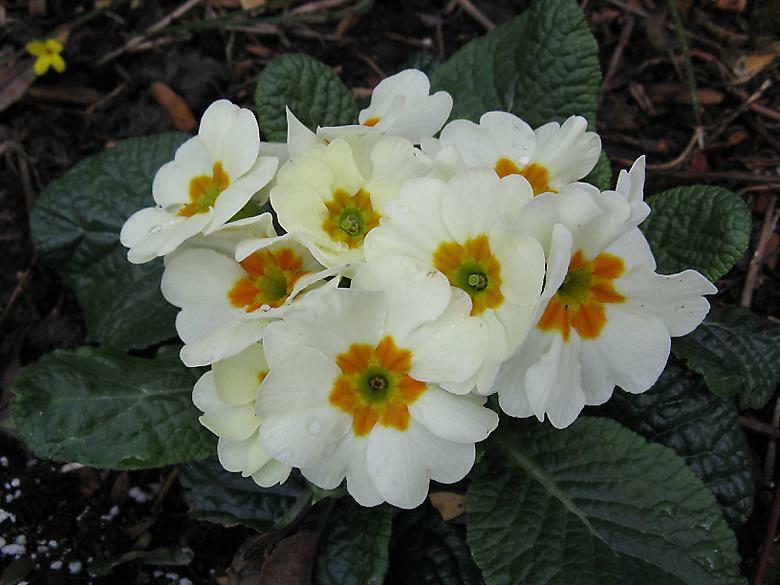 There were flowers on the blue Primrose that was already here as well as the Winter Jasmine. 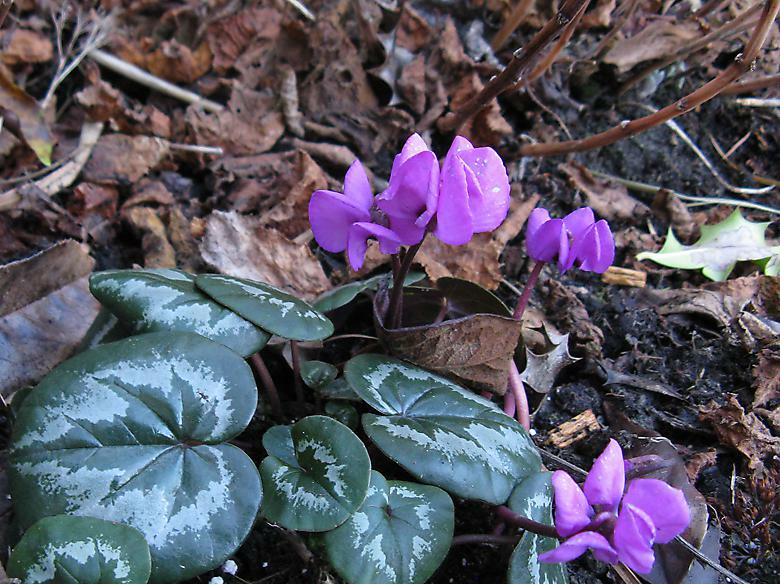 The Cyclamen coum has the most lovely shade of magenta that unfortunately is not fully captured in this photo. Snowdrops appeared and have quickly started to flower. The ones I bought last year are lagging and are only showing tips of their leaves. Oh and there was a flower on the Sidalcea that opened early in the month. 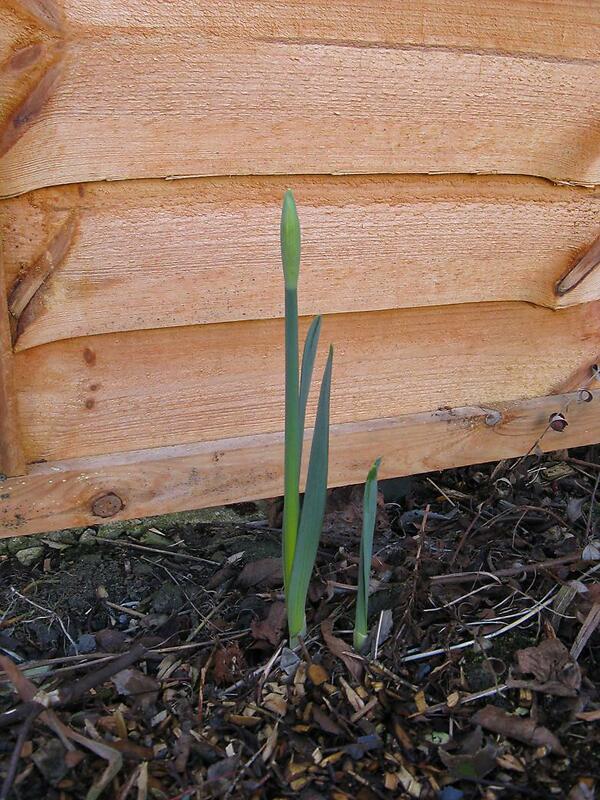 Daffodils are growing in various areas of the garden, this one is particularly far along, but most do not have buds showing yet. I planted 3 sets of 10 tulips, lots of crocus, bluebells, Anemone blanda and some Ipheon. Many crocus are showing, along with a few tulips and I think the Ipheon. There is no sign of the the bluebells or Anemone yet. Since I didn't want a repeat of last years bluebell disappointment, I got a pot of bluebells just in case, which have been planted out. The back corner gets most of the sun, it even gets some during the winter. Currently there is nothing much there, and I want to make room for some sun loving plants and maybe a bench. I have already removed the two roses and cut back two shrubs which will be removed soon too. There are several cotoneasters growing (probably self seeded) and I have removed a couple of them and cut back some more. The pyracantha has been trimmed a bit too. The main flower there was a patch of Montbretia which will be removed. I've planted a few bulbs in the area, and once they are up I will plan what to do next.